A week-long celebration and gathering of our community’s diverse arts and cultural offerings. 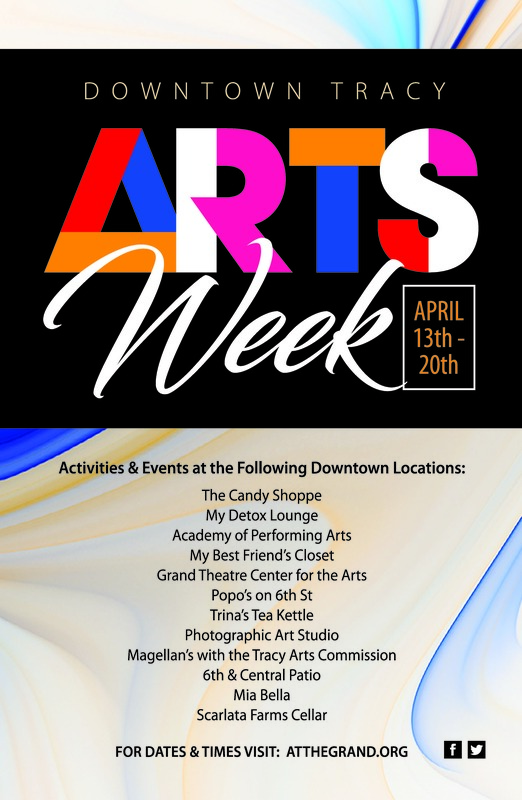 This downtown Tracy event highlights the vibrant art and culture Tracy has to offer by hosting creative arts related events, such as: an art walk, storefront displays, live music, exhibitions, paint night, demonstrations, performances, workshops, & much more! 624 N Central Ave Promo – Golden Egg with every purchase with a discount of 10%-50% off next purchase. 917 N Central Ave Stop by and add your bit of art to our community canvas. At the end of the week we will display the finished product. 620 N Central Ave Tea Tasting, scone and Education $10.00. RSVP 209-650-0166. Tastings offered every 45 minutes. 715 N. Central Ave Arts Education Program presents Senior Tuesdays at the Grand – Easter Activity – Free, Activity #16762. Secret Garden Ticket Giveaway. 715 N. Central Ave Arts Education Program presents Family Paint Day – $25.00 Res $27.00 Non-Res. Ages 8 and up. 975 B Street – Upstairs Alice in Wonderland Productions “the creative process.” Open rehearsal, observe, and ask questions as the Children’s Dance Theatre rehearses, creates, and evolves. These tickets will go on sale to the public online only Saturday, August 11th at 10am and in person or over the phone starting Monday, August 13th.